Hi! I'm a AJ, a TV presenter living in London. Like many people, I don’t like just one thing. I like lots of things! So welcome to my little space on the internet, documenting my love affairs with fitness, music and fashion, fusing the worlds of work and well being together and sharing with you my London (and sometimes global) escapades. People talk and below is a lot of things that my TV agent says about me. To their credit... it’s all true. AJ is one of TV’s most exciting rising stars. With her exuberant personality she is fabulously suited to live and studio presenting. 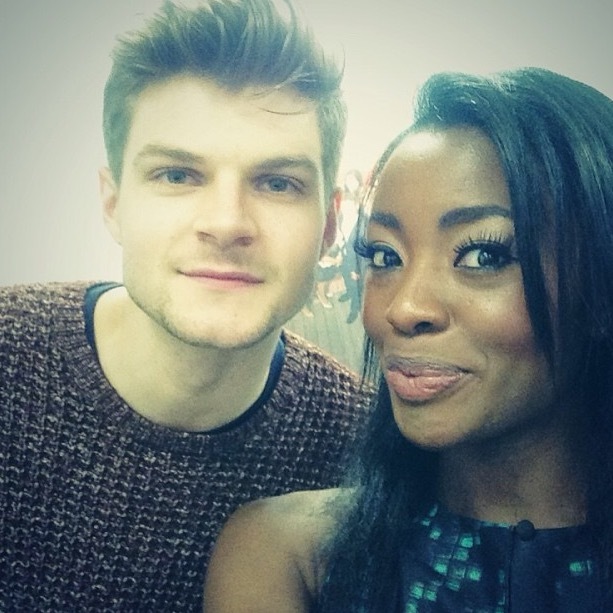 She has showcased her talents most recently by hosting ITV2’s music show The Hot Desk and 4Music show, Trending Live. Already a well accomplished live TV presenter, AJ has fronted Channel 5’s hugely popular Big Brother’s Bit on the Side with Rylan Clark and it’s sister show Big Brother’s Bit on the Psyche with Iain Lee. A reliably straight talking contributor to any panel show, AJ has been a guest on The Xtra Factor and Fake Reaction for ITV2, I’m a Celebrity Best of 2014 for ITV and Channel 5’s The Wright Stuff. An informed voice on all things popular culture, AJ has a string of music and entertainment shows to her name, including presenting BBC Two’s flagship Saturday morning music chat show The 5:19 Show for 2 years. She has reported live from the Isle of Wight Festival Festival alongside Jo Whiley and Zoe Ball for Sky Arts; hosted red carpet coverage at the MOBO Awards for MTV, and fronted coverage of BBC Switch Live from the Hammersmith Apollo for BBC One. Currently, AJ hosts the weekly chart show on Hoxton Radio. A qualified personal trainer and sports nutritionist, AJ has a huge passion for health and fitness which has lead her to presenting snowboarding and music show Freeze Festival, surf and music show, Roxy Pro as well as, fronting surf and skateboard competition, Boardmasters, productions all for Channel 4. AJ is a well-established event host and DJ, having spun for Ibiza Rocks, Century Members Club for London Men's Collection and warmed up for world famous DJ, Oliver Heldens at Sushi Samba. She is also an advocate for brands that have included Nike, Fitness First and Reebok. Most recently, she has hosted her own health events in collaboration with Juicy Couture Sport, fronted Les Mills x Reebok One Live UK arena tour and even secured a brand partnership with Adidas for their #workit series. Online, AJ has impressive clout with her popular self-titled blog and YouTube channel, where she posts a range of lively fashion and fitness videos, amassing 377,000 views and counting. AJ also wrote weekly lifestyle columns for Hello Magazine online for 2 years. Described by Glamour Magazine as having “the voice of Vera Duckworth and the looks of Naomi Campbell”, AJ brings her straight talking chat with heaps of charm and glamour to every project she works on. Her warmth, genuine passion for the shows she hosts, and down to earth attitude have made her the perfect professional to work with. Born to Nigerian parents, AJ grew up with her five brothers and two sisters in Blackburn, Lancashire and has a degree in English & Politics.